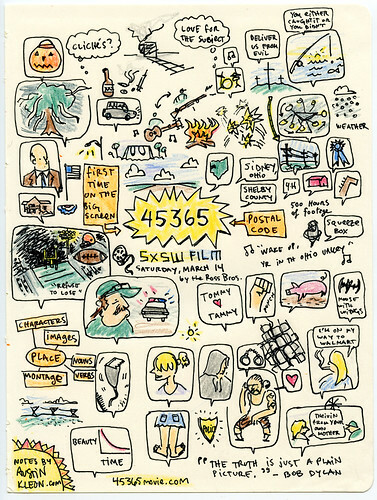 If you read this before the end of tonight, you can watch 45365—the best movie I saw at SXSW 2009—for free online at Hulu. A couple of brothers from Sidney, Ohio (really nice guys, too) made a documentary about their small hometown. I grew up not far from Sidney, and I can tell you it’s the most honest and moving portrait of home that I’ve seen. These are a couple sketches I made during the movie and the Q&A a few months back. Too bad it only streams in the US. 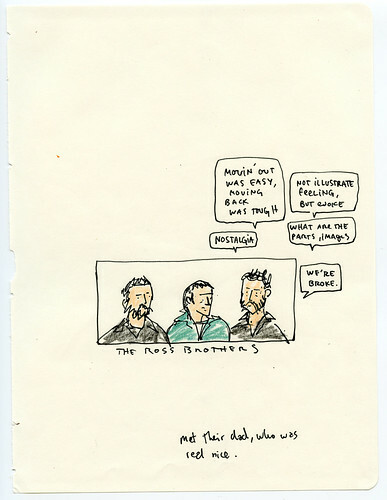 Your drawings make me want to see the movie.